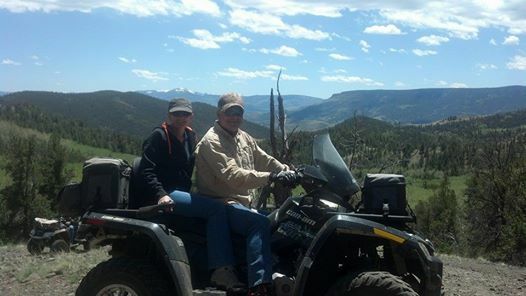 We have been going out on the ATV's some lately and the real challenge is finding trails that are open. A lot of the high country is blocked with snow and some of the trails are completely washed out. So caution is the word if you are going to go try some of the areas for a ride. We were able to go up to Shorty Springs after church which is up toward Embargo Creek. This is a normally arid area all summer and can get very hot so early season rides there are best. Some friends from church gathered after services and we had a great time eating lunch at the small homestead. The door to the shack is so small and hence the name Shorty. I will have to get a pic for you later for that. Below see some friends who made the ride. My dad has been going several times a week and I am very proud of him. He bought his first off road machine this year at the age of 83. It will open up areas to him that he cannot access otherwise. So, old or young there is opportunity for you to see the Colorado back country. We did have one machine quit on us and had to tow it down but that just proves that you should never go alone into the mountains if at all possible.